SGstocksandshares (SGSAS): What does Hyflux tells us about the Singaporean investors? What does Hyflux tells us about the Singaporean investors? Hyflux's distress may just be the beginning of a series of default risk situations. The troubles of water treatment firm Hyflux signals more challenging times ahead for the larger Singapore dollar bond market as close to $4b (US$3b) of SGD corporate bonds are set to mature by the end of 2019 and the number is tipped to hit around $13.53b (US$10b) by 2020, according to estimates from S&P. Before reading further, please understand that this post is not going be discussing how one can recover back the invested money, or to garner monemtum to rally for a change in regulations or what nots. It is just going to be my observations and comments on the Singaporean investors' mentality, as well as the state of things for Hyflux. Hyflux Ltd (Hyflux), founded in 1989 by Ms Olivia Lum is a global environmental solutions[clarification needed] company listed on the Singapore Stock Exchange (SGX), and employs over 2,500 staff in the Asia Pacific, the Middle East, Africa and the Americas. The company was founded in 1989 by Ms Olivia Lum, Group CEO, President and Managing Director. In 2006, the company was given the 'Water Company of the Year' award, at the 'Global Water Awards', by the Global Water Intelligence, UK. Given the nature of this company, and in the context of Singapore where water supply is a matter of national security, it is not very difficult to understand why many Singaporean investors plonk their life savings into Hyflux. Be it bonds or equities or even preferential shares of Hyflux, investing in any of the mentioned asset classes is deemed as invested into the company, Hyflux. With all these general understanding and explanations above, let's now focus on the investors. Of which, a majority are Singaporeans. 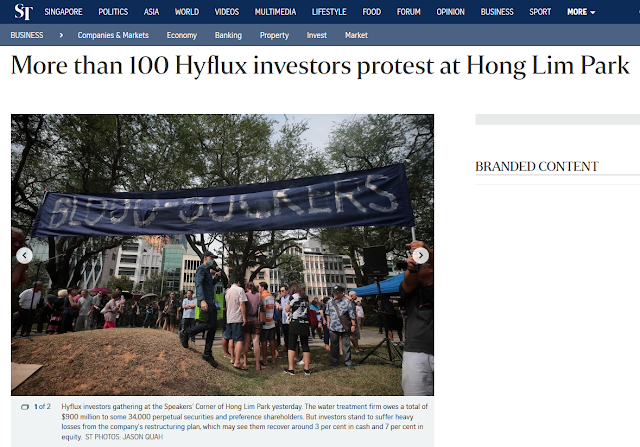 In Hyflux Ltd., there are 34,000 of these moms and pops, set to lose most – if not all – of the S$900 million ($665.5 million) they plonked down in the troubled Singaporean water and power firm’s preference and perpetual shares. This information is taken from: https://sg.finance.yahoo.com/news/dont-blame-singapore-investors-hyflux-loss-andy-mukherjee-023106678.html. These invested shares, preferential or perpetual, yield about 6% plus. In the SG market, this is reasonable and fair. The current market rate of dividend yield is about 3 to 6%, so 6% pa is considered on the high side. Not to mention the investing intention, that is to buy and hold for dividends. As such, the price of the security does not fluctuate very much. In fact, there are no transacted volume on some days. Starting from 2011, investors were happy. There were no qualms about it. As illustrated below, the dividends are smooth and stable. That is what investors like about, aint it? First signs of trouble came on 21 May 2018. The shares as well as other asset classes belong to Hyflux are suspended. Hyflux applied for court supervision to reorganise liabilities and businesses the next day. The company's earnings had been hit from "prolonged weakness" in the local power market due to the Tuaspring project, the first integrated water and power project in Asia, making losses in 2017 and first quarter of 2018, as an oversupply of gas in the Singapore market caused depressed electricity prices. This is typical what companies will do in the event of unsolvable trouble. On March 30, 2019, people gather to listen to a speaker during a protest on Hyflux Ltd. debt restructuring plan in Singapore. Judging from the picture from https://sg.finance.yahoo.com/news/dont-blame-singapore-investors-hyflux-loss-andy-mukherjee-023106678.html, it is probably 300 people or so. This rally is significant because it has illustrated clearly that investors are unable to stomach this loss. The suspension of a wonderful dividend yielding asset is a huge blow to investors' dream and expectations. They had failed to envision the worst case sceranio if the company ran into issues at that point of time before investing. To be fair, the content of the protest cannot be found online. Likewise, there are no witten or spoken agenda of that protest. However, from the picture below of a banner with the word "Blood Suckers" sprawled across, it can be inferred that the affected investors are seeking every possible avenue to demand their money back. The investors in Singapore are too positive and simple when it comes to investing! Risk and return are both sides of the coin. No matter how you split the coin into a half, there will always be 2 faces to the coin. One cannot simply have great returns without great risks! Using a crude analogy: investing, trading, speculating, fundamental investing, technical reading, whichever one calls it, it has a certain degree of risks and probability in it. From the past to the future and beyond, risk and return come hand in hand. Similar to a game of dice, the simple gambling game of guessing big or small, if the investor/trader/speculator has placed bets on a certain position, the participant cannot recall back the money or worse, urging others such as authorities to assist in recovering the lost bet. By doing so, it just being a bad loser. Yet this actually happened in Hong Lim Park. Do understand it is NOT the intention here to put salt in the wound and to mock and jeer of the monetary loss of investments in Hyflux. It is also not the intention here to be on the high horse acting smart, or worst, being a clairvoyant who is able to read and see the future congratulating those who did not invest in Hyflux. The observation here is on how extreme the investors are to the extent of urging authorities to assist in recovering their money back. While it is right to attempt to recover the lost money, it has to be of the right and fair methods. Their demand that the Singapore government should step in has been a nonstarter, even after some of them even organized a rare protest at the city’s Speaker’s Corner to try to squeeze out a better deal. And that protest actually happened. It is unbelievable. From the above illustration and actual incidents, it is clear that investors are still rather simple, straightforward and expected to be spoonfed. If they continue to be so, they will never improve and fail to plan for themselves properly. And to make things worse, it will incur structural changes within the market to stem out such investors in future. More new regulations certainly sounds good. Alas, too many regulations stifle our market. Look at our SG market compared to all major markets now. How can we continue to maintain as financial hub still? Losing money is upsetting and can never be a good experience. Yet being a bad loser creates a vicious cycle resulting in ignorance and greive for everyone around, like a drowning man dragging everyone down along.